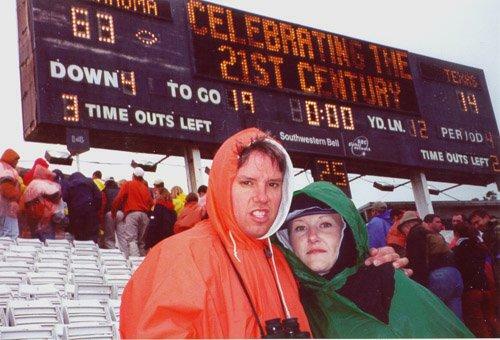 #11 1996 - Oklahoma @ Dallas - Oklahoma gets its first victory in five tries in its worst season (3-8) in decades against heavily favored Texas in both team's first overtime ever. After settling for a tie in 1995, the teams do it again the next year but with new OT rules in effect. OU scores the last 11 points (including a 2pt conversion) to force OT. Texas settles for a FG and OU drives a TD to get the OT victory. Texas loses 4 of 5 games but still wins the first Big XII crown by beating once sure national championship bound Nebraska in the conference championship game. #10 1992 - Texas A&M @ Austin - The 100th meeting of the teams featuring both the aggie and Longhorn bands playing side by side at half with a fireworks show. An aggie corpsman tackles the Texas cheerleader carrying the longhorn flag and snaps the pole over his knee. A&M ends Texas' final threat with a 95 yd interception TD. Upon winning the game, aggie players kick and spat on the longhorn logo at mid-field and gesture to the alumni crowd on the west side. This so angered the longhorn faithful that they ran out onto Kyle Field at the conclusion of the 1995 game. #9 1987 - Texas @ Houston - Texas commits four fumbles and gives up 4 interceptions for TDs (3 by Shannon Kelly) in the 4th quarter (NCAA record!) to give Houston a 60-40 win.Luckily, the Astrodome sells beer at college games. #8 1984 - Texas A&M @ Austin - A&M wins in Memorial Stadium for only the 4th time in history and starts a harsh 6 game winning streak. Texas never beat A&M during my student years. #7 1993 - Texas @ Louisville - Wearing shorts from a 95 degree Houston to a 50 degree and raining Louisville, the second play of the game was a screen pass for 80 yards and then it only got worse. Lovell Pinkney scored a 25 yd passing TD and danced in the endzone to the jeers and laughter of the Louisville crowd who were enjoying a 34-10 whipping of a basketball school over the mighty longhorns at the time. Final score 41-10. #6 2000 - Oklahoma @ Dallas - Oklahoma administers the worst beating in the OU/UT game history on a UT team picked to compete for the National Championship. OU scores touchdowns on its first four possessions and get an interception/touchdown during Texas' fourth possession. An overconfident Texas team is dealt a 63-14 loss. OU could have scored 70-80 points had they wished. #5 1996 - Texas @ Virginia - My third out-of-state game gives the same results. Cold, raining, and Texas getting whipped by a lesser ranked team (93-Louisville & 95-Virginia Tech). James Brown throws 5 interceptions in the first half and the Texas defense pats Tiki Barber on the back as he runs by them for TD after TD. All Virginia turnovers in the 2nd half were overruled by questionable Texas penalties. WasGrant Teaff coaching Virginia in his final game once again? #4 1988 - Houston @ Austin - The worst loss ever (at that time) at Memorial Stadium witnessed with the best tickets I ever had. My 50 yard line seats were vacated by the end of the 2nd quarter as Houston annihilates Texas 66-15. #3 1989 - Baylor @ Austin - Baylor wins at Memorial Stadium for the first time since 1951 using four interceptions and four recovered fumbles to whip Texas 50-7. My last game as a student at UT. 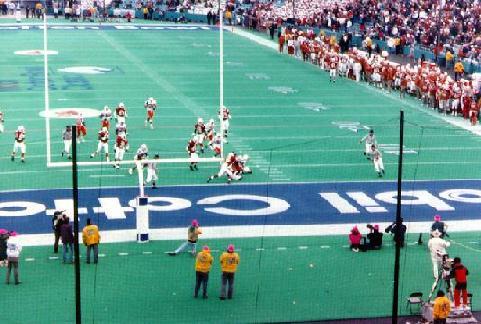 #2 1991 - Miami @ Cotton Bowl - Miami converts a 1st and 40 on their first series and goes on to pound Texas 46-3 on national TV. I have blotted the rest out of memory. #1 1997 - UCLA @ Austin - UCLA converts 8 Texas Turnovers into 6 TDs and buildsa 38-0 lead by halftime and goes on to win 66-3. The 2nd worse loss in Texas history since the 68-0 loss at Chicago and worse ever at Memorial Stadium. It was also the worse loss ever by a ranked team to an unranked team in the history of college football.Thanks for letting me be a part of history.